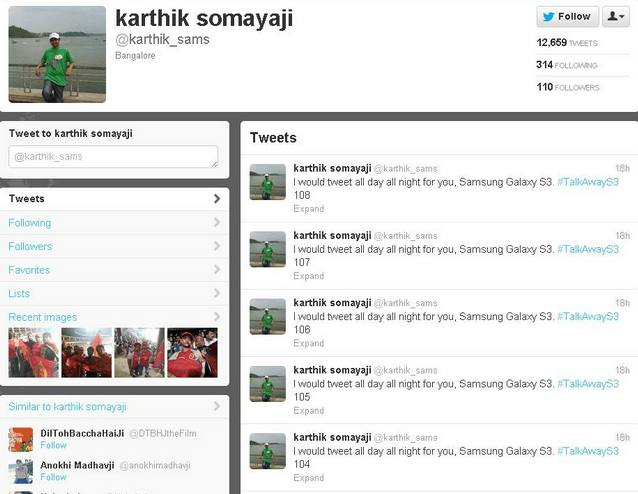 As we all know Samsung launched its Latest version of Galaxy S3 here in India. Ever since it’s been launched all the Samsung fan boys are exited about it’s latest feature of 4.8” of super AMOLED HD display, 1.4Ghz quad core, 1GB RAM, ICS 4.0.4 apart for this the latest S-voice, S-Beam, Pop-up Play enthralled all the Samsung as well as Smartphone fan boys. 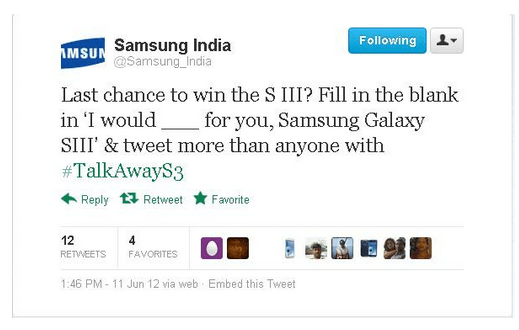 Most of you knew that, Samsung has recently organized a contest on twitter with caption “TakeawayS3”. The main motto of this contest is “the more you tweet, the more the chances of winning Galaxy S3 for free” as you can what @Samsung_India has tweet here below. Ever since the contest began tweeps started to tweet “TakeawayS3” using the hashtag, till date there were approximately 20,000+ tweets has been posted. 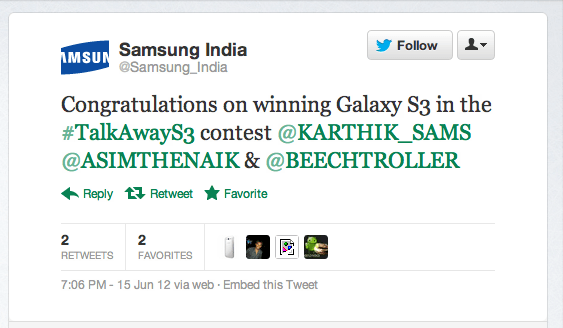 After a long wait today @Samsung_India has finally announced its three winners of “TakeawayS3” contest. One can say that, this is one the biggest scam that has ever happened in twitter contest. 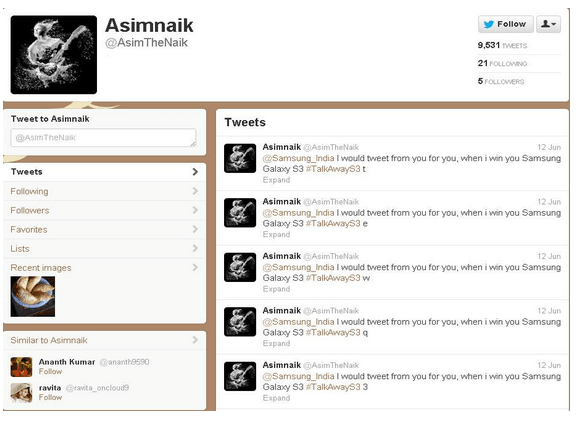 The winners used the same strategy of using same sentence and tweet it for 1000+ times have a look at yourself. As I have said many has tweet in a proper contest one tweet has said “I would stop having food, for you Samsung Galaxy SIII” other said “I would dump my girlfriend, for you Samsung Galaxy SIII”. 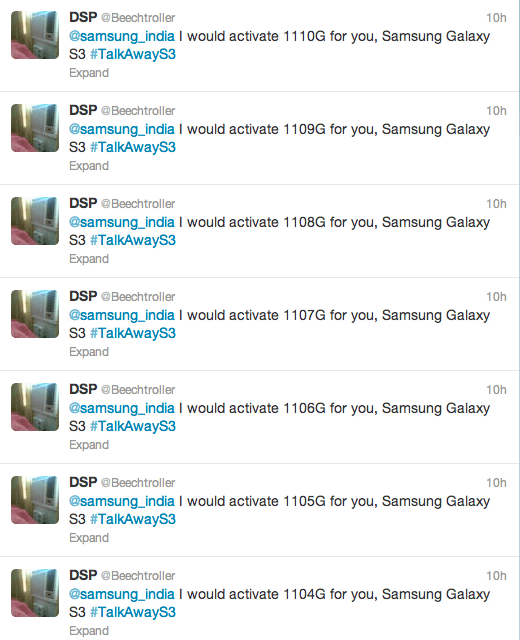 Let me remind you folks, the cost of each Samsung Galaxy SIII is approx Rs.43,000 and I really do not understand the strategy of @Samsung_India in announcing its winner for just some lame tweets, Samsung should come out and justify in announcing their “TakeawayS3” winners.What’s your opinion folks? and i must tell u that i know all winners of this contest personally, and they are hackers, its a complete shame. I would agree to disagree with the word “Scam”…. The terms if the contest didnt specify as to what you have to be in the content of the tweet..